EDI (Electronic Data Interchange) provides businesses with a standard way to exchange information electronically. While E-commerce has become a particularly hot topic in recent years, EDI has been around for decades primarily used by governmental agencies as well as large corporations and their suppliers. In the U.S., the standard format is coordinated by ANSI (American National Standards Institute) and is referred to as ANSI X12 (X12 is the assigned identification code of the ANSI subcommittee responsible for overseeing the standard). There are literally hundreds of business transactions or documents that have been developed for which an ANSI X12 standard exists. Common commercial EDI transactions include invoices (EDI transaction 810) , purchase orders (850) and shipping notices (856). To convert information to the ANSI X12 standard, a software program (typically called a "translator") is needed. Further, EDI transmissions must also adhere to certain communication rules and regulations ('protocols'). In the U.S. the most common protocols are asynchronous and bisynchronous. Because most systems use a single protocol, there is also a need for protocol conversion. Value Added Networks (VANs) provide that ability. While there is a lot of talk about using XML (exTensible Markup Language) to potentially replace or enhance current EDI standards and to use the Internet as the transport mechanism, EDI today is still primarily conducted using a VAN and translator software. Based on increasing expressions of interest in EDI capabilities from both existing and potential users as result of requirements imposed upon them by large commercial concerns, DBA Software formed in 1998 a working partnership with Technology Management Programs (TMP) to provide users of DBA software with the ability to conduct business via EDI. A new interface module (originally ED, later moved under the DE - data exchange - module) in the DBA software provides the ability to both import purchase order data and export shipping and invoice information. 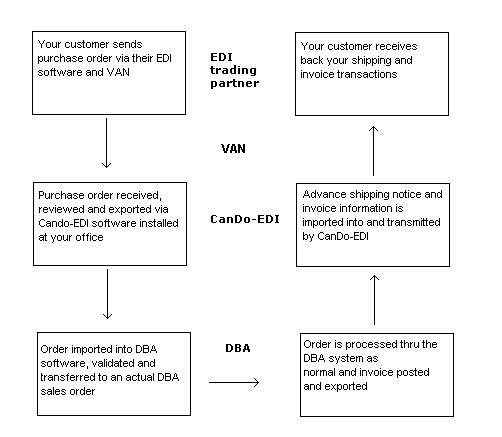 TMP's software program, CanDo-EDI, translated incoming data received via TMP's VAN and creates a file that the DBA EDI module can in turn process; CanDo-EDI could also later import shipping and invoice information exported via the DBA EDI interface and translate that information and send it back through TMP's VAN and ultimately back to the originating party. The requirement to use TMP's VAN as a general rule does not mean that a DBA user is in anyway limited to who they can transact business with. As a general EDI translator, all information sent/received can be seen and viewed "manually" in the Cando-EDI software. Only certain portions of the extremely complicated EDI field segments are actually imported into and exported out of the DBA software. With the change to DiCentral as of about January of 2012, Cando-EDI is no longer used; but the general information presented here is still essentially still how this works. Despite the fact that EDI transactions are transmitted using standard formats, different EDI trading partners implement those standards in completely different ways. In many (perhaps most) cases some additional customization to the basic building blocks provided in the DBA EDI module may be required to meet the extremely diverse requirements that may be imposed by a given large commercial concern. Even on the VAN side, a special "connection" has to be established individually for each and every trading partner that a given DBA customer may wish to conduct business with because of the specialized nature that these transactions must typically be handled.